Judge if you must, but I indiscriminately talk to my close friends and certain family members while in the bathroom. Seeing as how my balance is currently shot, and I have to crutch my way everywhere, I have been careful to use my headphones and put my phone in my pocket when having this special bathroom phone conversations–That way I wouldn’t drop my phone on the floor or in the toilet while trying to balance myself on one leg and balance my phone using my neck and shoulder. It seemed to be a method that worked just fine until Saturday night. Saturday was somewhat mild as far as the pain was concerned. Mornings have consistently been the worst, and Saturday was no different. But going into the afternoon and evening, I actually felt pretty good. That was until I went to the bathroom, and placed my phone (attached to my headphones) on the counter right next to the toilet. I lost my balance and flailed my arms in just a perfect way that my hand got stuck in the headphones and sent the phone flying directly into the toilet. If there is a silver lining, it is that I had not actually gone to the restroom yet, and I was able to get it out fairly quickly. The bad news, it immediately stopped working, AND I tweaked my right leg and knee in a way that had me in more pain than I’d been all day…it sucked, a lot, but instead of pretending like I’m not a grade-A cluts, I’m choosing to share it. I did the things they tell you to do…shut off the phone right away and shake out and soak up as much of the water as you can. Years ago, I dropped my phone in my dogs’ water bowl. It was completely kaput, and even though I had three phones at that time in my life, I was still certain the world was going to stop spinning on its axis. My little brother told me of a method he had used before–wrap the phone in a large towel, and secure it with rubber bands, then put it in the clothes dryer. So this is where I started last night. With the help of my mother of course, I wrapped up the phone and stuck it in the dryer. A while later, the thing turned on, but it only worked and stayed on when plugged in. I figured that at least it turned on, and I could figure out what to about it the next morning. The next morning came, and now my phone no longer worked and was instead flashing the Apple logo at me. I tried to turn it on and off, plug it in, unplug it, plug it into the external battery pack, and basically everything else I could think of….no dice. 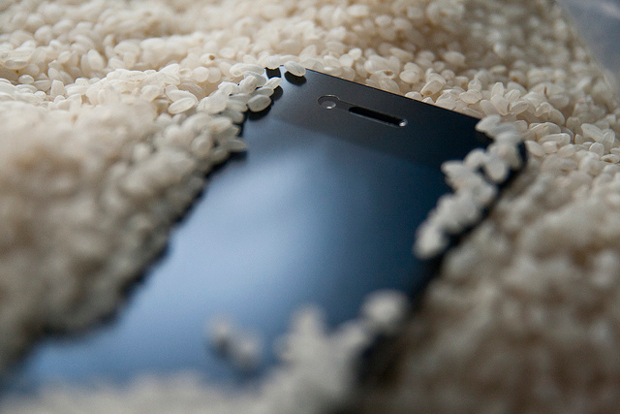 I’ve never tried the rice method (fill a ziploc bag with rice and submerge your iPhone in it for at least 24 hours), but I was and am desperate and willing to try anything. So, as it stands, a $3 bag of brown rice stands between me and having to drop a stupid amount of money on a new phone. The good news is that it seems everything has been backed up properly, and earlier Saturday, I got all of my music and pictures onto my laptop. That’s definitely good news, and the opposite happening could have made this situation even worse. And while I would like to pretend that I’m feeling liberated or something wonderful because I don’t have my phone attached to my every movement, I don’t. I hate it. All day today I wanted to reach for my phone to do things and couldn’t–check the weather? Nope. Check the scores of all the games on my lovely ESPN app? Not a chance. Look up news stories pertaining to the conversations we were having at our family Sunday brunch? No can do. Oh, and then of course there’s making phone calls to friends and family like I usually do on Sundays–that didn’t happen either. I know there are unbelievably horrible things happening all across our country and around the world. I understand that in the grand scheme of things, a non-functioning cell phone isn’t that big of a deal. But I’m in pain, can’t move or walk very well or drive or travel in any way, and right now, my lifeless cell phone is stressful and frustrating, and one more potential financial burden that I could do without right now. We’ll see what happens tomorrow when I pull my phone out of the rice…in the meantime, fingers are crossed and prayers going up. *Please note that none of the things I’ve mentioned are based on any sort of scientific fact or research, so try at your own risk!! Why oh why are you following my bad habits? I am presently STUCK with a cheap ” will make it work until I can upgrade” phone due to a dishwashing accident with my phone…I pulled mine apart and did rice and then DAMP RID…it worked but kept dropping calls, etc so I retrieved my info and am waiting on my upgrade by the end of November to save myself $400.00…However, my best phone story was when it slipped from my pocket into an AUTO FLUSH TOILET…wedged in the hole as the water went Whish,which,whish about 30 times until I reached in and grabbed it! It was then I decided I am moving in with the Cleaver Family and saying adieu to electronics! But, that only lasted about 2 hours until withdrawal set in…Keep smiling!